Bin collections have a fortnightly pattern. Willersey bins are collected on Tuesday from 7:00am onwards. Enter your postcode and address in here to find out which bin(s) to put out in any week. Any non-recyclable rubbish put out in black bin bags alongside or on top of your grey wheeled bin or beige bag usually will not be collected, except during the two-week Christmas holiday period when additional ‘side waste’ will be collected during your first full collection after Christmas. So your electricity goes off. No matter who you buy your electricity from it is provided by Western Power Distribution. Their emergency number to ring from a landline is 0800 328 1111 or 0800 6783 105 or 105 or from a mobile 0330 123 5008. ( Do make a note of these numbers on paper?! You would also need a landline phone or mobile which does not require mains power.) If they fail to restore your supply ( in normal weather ) within 18 hours, they are committed to credit you with £108. You can also find out about your power cut by going to Western Power Distribution website and clicking on the Power Cut link but if you have no power?? Willersey is on mains gas so the most likely supplier will be British Gas. The ultimate provider of our gas is Wales & West Utilities. Here are frequently asked questions for domestic and business customers. Here is more detail about the pipes being replaced (shown as red dots). Thames Water provide our water. Please call the 24 hour leakline on 0800 714 614 to report a leak. 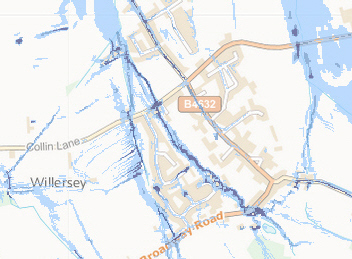 Interactive Flooding map for Willersey. Click here to find a range of Broadband and phone deals in Willersey. The support number for BT from a landline: 0800 111 4567 and from a mobile: 0330 123 4567. You can check the validity of any 0900 number on the official website. 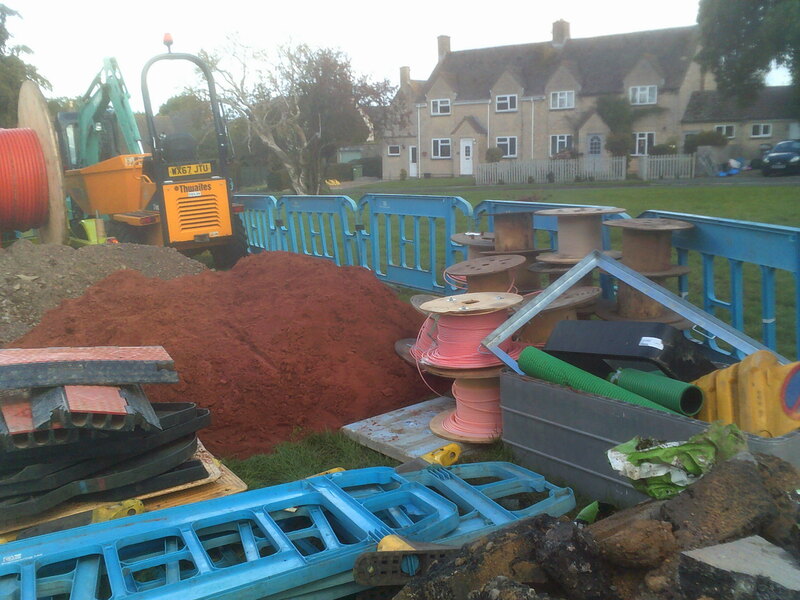 High speed fibre optic broadband is on its way to Willersey. Here is a flyer from Fastershare issued in July 2018 about the installation of fibre broadband in Willersey. You can register on their website for updates. We are connected to the Broadway telephone exchange - BT code WMBDY and Broadway 6 Cabinet in Worcestershire. This cabinet is went live in and December 2016, which means postcodes connected to this cabinet could benefit from a speed uplift. For the latest news check this BT website or also the DSL Checker. 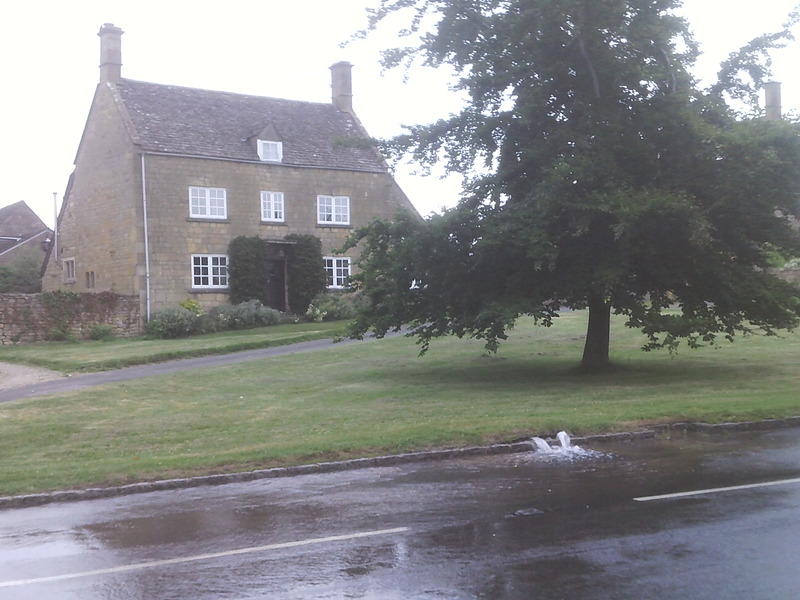 As of March 2015, BT installed the fibre cables in Willersey in a cabinet near The Pike roundabout. 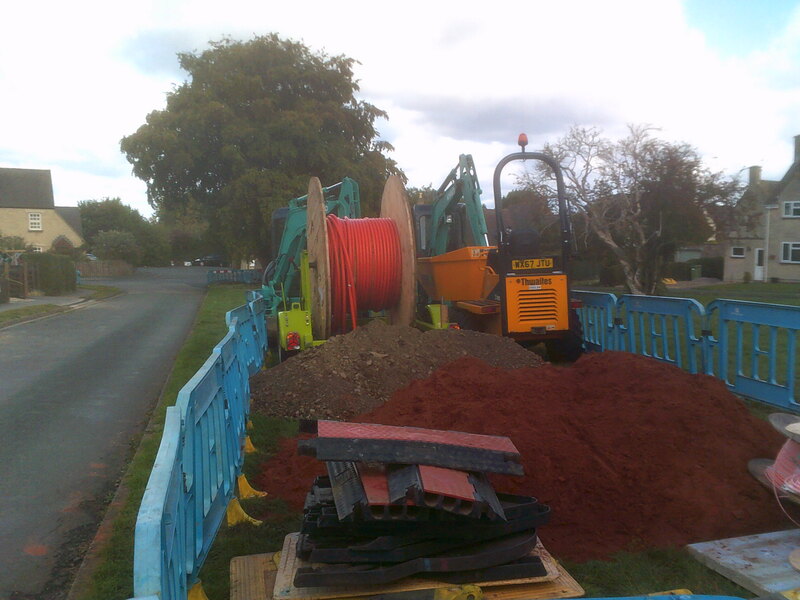 Fibre cable is now (August 2018) being installed throughout Willersey. For directory enquiries you can avoid sky high charges by either Googling the number you want or dialling 0800 118 3733 for free, but you have to listen to an advert first. Mobile phone coverage in Willersey can be patchy. Currently the best supplier looks like Vodafone but reception will depend on your location and the model of phone you are using. Some smart phone models will connect through a wifi signal. You can also buy a Sure Signal box which may help Vodafone reception in your house. O2 provides wifi call . Other providers do not yet have this type of facility. A manager from Western Power, Mr Dan Roberts, has been in touch with the Parish Council with an explanation for the power failures on Saturday and Sunday. It would appear that the transformer in Pool Orchard developed a fault and will need replacing in the near future. Dan Roberts has said that it will be 12th January at the earliest before they start work so it appears it will not be this side of Christmas. The Loss Adjuster is from a company called Cunningham and Lindsey. His name is Chris Booth on 01212336757 and their reference number to quote is 8032326.